Blog Quick Quotes: Everyday Inspiration with Barb! Greetings to you! It's Barb here today to host the blog for you and share a video too! 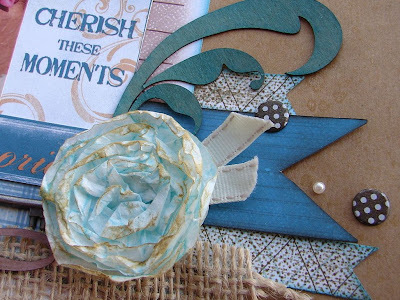 Do you ever have one of those moments when you are using an everyday item and you realize that you could turn it into a great scrapbooking/card embellishment?! Well, I did! The other day, while making coffee, I decided that the coffee filter was the perfect material for a flower! 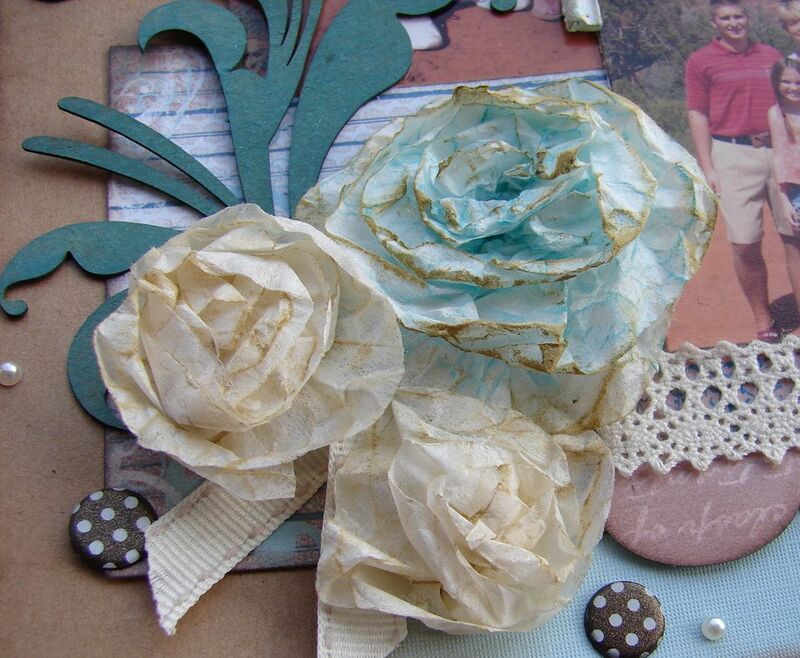 I am going to show you how you can make your own flowers using coffee filters and Quick Quotes PowderPuff Chalking Ink! I absolutely adore the Stowaway collection! The blues and browns are gorgeous and is perfect for so many types of photos! This time I used it for some photos of my parents with my kids in Sedona. To make these flowers, I used coffee filters with PowderPuff Chalking Ink in Tahiti and Biscotti. The chipboard flourish was colored using Baja Blue PowderPuff Chalking Ink and then I misted it with shimmering mist. Behind the flower cluster is a sheet of patterned paper from the Stowaway 6x6 Paper stack. The print is a smaller scale than then 12x12 size and worked great on this layout. 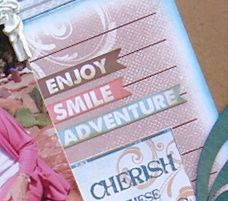 The "Cherish These Moments" and "Memories" tags are cut from the 6x6 Stowaway paper stack, too. I love that these collections include quotes and journaling tags. They are perfect for layouts and cards! These darling little words were cut from the Stowaway Stickers and inked up with PowderPuff Chalking Ink in Biscotti. 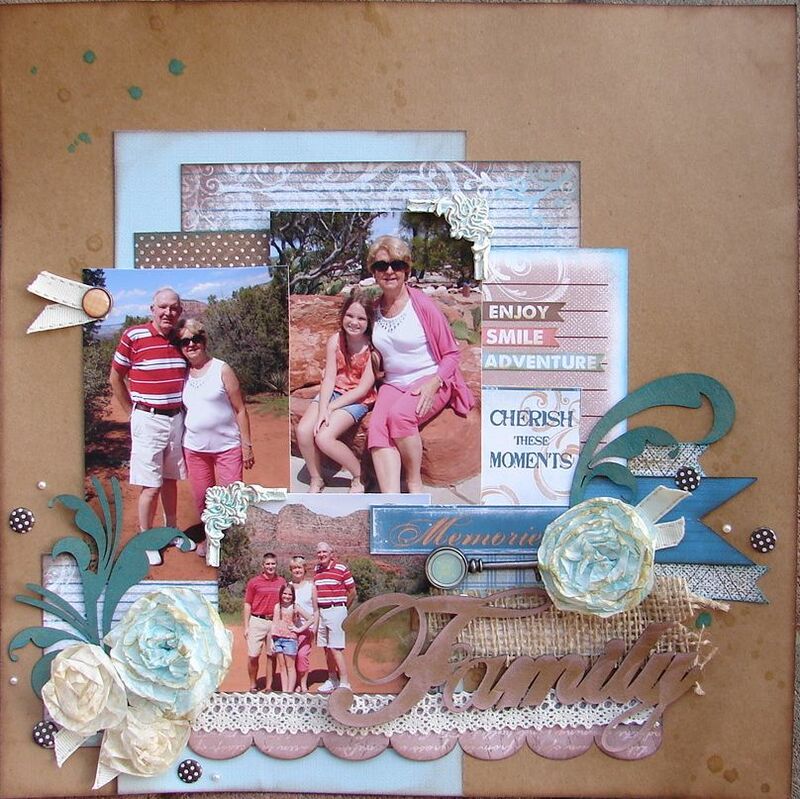 The chipboard "Family" die cut is from an older Quick Quotes Club Q kit. I colored it first with the new Java PowderPuff chalking ink and then went around the edges of it with the new Dusty Rose PowderPuff Chalking Ink. I love how it gave it a nice, soft outline. And... if you were wanting to see how I made the coffee filters flower, you are going to need to watch this video! Enjoy! GREAT idea using the coffee filters, definetely trying that. Great layout too! What a fun technique!! I'm going to have to give this a try! They look so amazing on Barb's project! Barb, this is such a beautiful layout. Just loving the color hues and sweet design. I love the coffee filter flower, how cute!